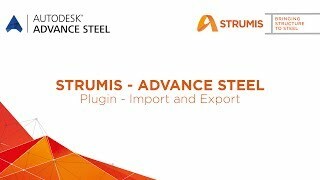 Users of Autodesk® Advance Steel now have a more direct flow of information between Advance Steel and StruMIS. Previously having to rely upon on the SMLX file export (previously GTCX) from Advance Steel to get the necessary information transferred to StruMIS. This addin outputs a BIMReview BSWX file which is native to StruMIS reducing the number of file read errors and producing a more tailored output file. Fabrication information canalso be imported back into Advance Steel via BIMReview BSWX file where the user will be given the option to map specific attributes from the BIMReview file to fields in the Advance Steel model. Upgraded files to match BIMReview 8.3.1 release and can now save down to lower versions of BIMReview on the save dialog.